If any RC priest dared to ignore this report in his homily the Sunday following its publication, it would only increase the betrayal and hypocrisy, delivering yet another death knell to an institution that has stood as a bulwark for Truth, claiming the exclusive corner on salvation, shepherding a global flock with a benign patriarchal/fatherly hand – or so many thought. While many reports of clergy sexually abusing minors have been released in the past decades, this report somehow has an acid core: never before has the dichotomy between saint and sinner been depicted so graphically and detestably. Never before has anything cast such shameful light on the immaturity and irresponsibility of men – underdeveloped, weak and terrified of their own humanity – intoxicated with ecclesiastical power deformed by an institutional harnass of an all-male celibate priesthood that ended up choking them softly and sweetly, taking unsuspecting innocent lives with them. I feel like throwing up … We desperately need an ecclesial #MeToo movement as well as an ecclesial Truth and Reconciliation process. How come such secular initiatives keep arising from outside the very institution that claims the preferential option for the poor and vulnerable and abused, and that claims to be all about truth and healing, justice and reconciliation in Christ Jesus? The betrayal and hypocrisy are simply too much to comprehend … Shell-shocked bishops are fumbling inadequate responses, priests are becoming hesitant about wearing their collar in public. All of a sudden, Catholics are wondering: are you one of them too? How deep and wide does this virus go? On August 20, 2018, Pope Francis published a Letter to All the Faithful. Here is a poignant commentary on Pope Francis’ letter that articulates many of my own deepest feelings and emotions. An agonizing reflection by a faithful Catholic is here. For those who seek a broader historical analysis to how we got here, read Massimo Faggioli‘s thoughtful piece. So here we are, summoned at the proverbial moment’s notice. Just this past May, Brody finally had the courage to propose. Wow, great, replied Josephine, and then insisted on a summer wedding, with barely 3 months to prepare! Great joy, mixed with grumble, grumble could be heard in a few corners. How to get ready in such short time?! But a loving army rallied and here we are. Joy has won! Your love, Josephine and Brody, is finally ready to be shared and celebrated with the world. The beauty and attraction of idealism comes through at most weddings, including this one. Even in the face of high divorce rates, women and men keep making the radical choice of a lifetime commitment in matrimony. Some call it foolish; others call it holy. I’m guessing that most couples like you, Brody and Josephine, have big portions of both foolishness and holiness. But why does the Church call marriage a sacrament? A sacrament is an action or thing which makes the invisible God visible and tangible through human and material things. In other words, a sacrament is a doorway into God. God’s first sacrament is creation itself; many of us easily experience a divine presence in nature. Later today we will continue this celebration at our farm near Cochin. If you haven’t been there before, rest assured that you that you will easily sense God’s hand in the beauty of that place. is a reflection of God’s loving nature and purpose. While Jesus’ words from Matthew’s Gospel, the Beatitudes, are well-known and well-loved by so many (I will come back to them later), it is our second reading that contains some important keys to a good marriage. Who will separate us from the love of Christ? asks Paul in his Letter to the Romans, and to us. Well, maybe a rhetorical question, because nothing can separate us from God in Christ Jesus. However, while your marital love will feel indestructible today, Brody and Josephine, many things will try to separate you from one another. Despite today’s joy over our two people in love, human love, including marital love, is fragile and vulnerable, exposed to forces of division and strife, jealousy and resentment. Josephine and Brody, your decision to formalize your marriage covenant before God and in the presence of God’s holy people is important. This public commitment will serve as an anchor to ground you in stormy times and in times of alienation and pain. You are today committing to live your love as a Gospel witness in the world through the three C’s modeled by Jesus: commitment, communication, and compassion. The vows and promises you make today transform your relationship into a sacrament. God who created all things, who sent Jesus to reveal the fullness of human flourishing and the depth of God’s love, now transforms your marital love into a visible sign of God’s love for us all. Your commitment today touches hearts because it speaks of God’s eternal love for us. Making love and giving life are divine activities, and your marital union will now reflect that holy work. And this is where Jesus comes in. For making love and giving life was what Jesus was about, in ways far deeper and greater than only marriage. Jesus came so that we could see God in action. His life, his teaching and witness, his unjust and cruel death, and his resurrection are living testimony to the power of self-giving and sacrificial love. If you want to know me, God says, look at my Son Jesus who is the manifestation of my mercy, grace and love. Love is God’s commodity of choice. It’s all we live for and it’s all we die for. It’s all we get to take with us in death – love given and received. And at the Last Supper with his disciples, Jesus revealed the extent to which God’s love has been poured out for us. “This is my body,” he said, “broken for you, my blood poured out for you.” No one has greater love than this, to lay down one’s life for friends. The sacrament of marriage invites you into this holy gift of self, laying down your life for one another out of love and for the salvation of the whole world. St. Paul asks another rhetorical question: Will hardship, or distress, or persecution, or famine, or nakedness, or peril, or sword separate us from the love of God in Christ Jesus? (…) … You are exchanging vows and promises today. But vows are not magic, and they’re only a beginning. Your vows will need revisiting many, many times throughout your life together, because they will be tested through hardship, peril and distress. The vows will indeed provide an anchor in times of doubt, and they will challenge you greatly in times of conflict. Finally, these vows will lead you deeper into the image and likeness God has placed in each one of you. A few years ago I met A.J. and Patsy Felix, two aboriginal elders from a northern First Nation. And if you hang around with these two long enough, you will hear about their marriage. A.J. and Patsy are a great example of how marriage can deepen through the fires of distress, hardship and conflict. One day A.J. couldn’t stand himself anymore as an alcoholic and abusive person. So A.J. told Patsy to sit down because he was going to tell her who the man she married really was. A.J. told Patsy everything, holding nothing back. Patsy’s reaction was to get physically sick, and she threw up. Patsy did not talk to him for a week. A.J. gave her the space she needed by going for long walks. After a week, Patsy told A.J. to sit down because she was going to tell him who the woman he married really was. Patsy proceeded to tell him everything, holding nothing back. Now it was A.J.’s turn to get angry and not talk to her for a week. After several weeks of coming to terms with the pain in one another’s lives and hearts, A.J. and Patsy decided to build a sweat lodge together. They shared a sweat to let go of all that had harmed their spirits and that was harming their marital union. In their own cultural way, A.J. and Patsy were healed and reconciled. They have been reaping a deeper love, respect and affection for each other ever since. They now live in the intimacy of their love and in the knowledge that nothing needs to separate us from one another or from God. In the life, death and resurrection of Jesus, we can now see right into the heart of God. What we see there is mercy and compassion, humility and unconditional love, forgiveness and total non-violence. Brody and Josephine, like A.J. and Patsy,you too will learn to grow into and give concrete expression to your wedding vows in the day-to-day living – sometimes the hard way. As you live into your wedding vows the Church offers you the Eucharist as the holy food of self-giving love on the journey of your life together. After you make the divine promises of marriage to one another and in the presence of all of us here, you will bring up the bread and the wine as an expression of this gift of Christ. The Eucharist is the sacrament of God’s own self-giving in the person of Jesus. Take and eat this holy food often, not only physically but also spiritually. Eat and drink at the Eucharist and, in the words of St. Augustine, become what you eat: unconditional love and mercy for one another and for the world. Take and eat, take and drink, so that your marriage can grow into that same “Eucharistic” self-giving love in order to make God visible in our broken world and to bring healing and wholeness into that same world. 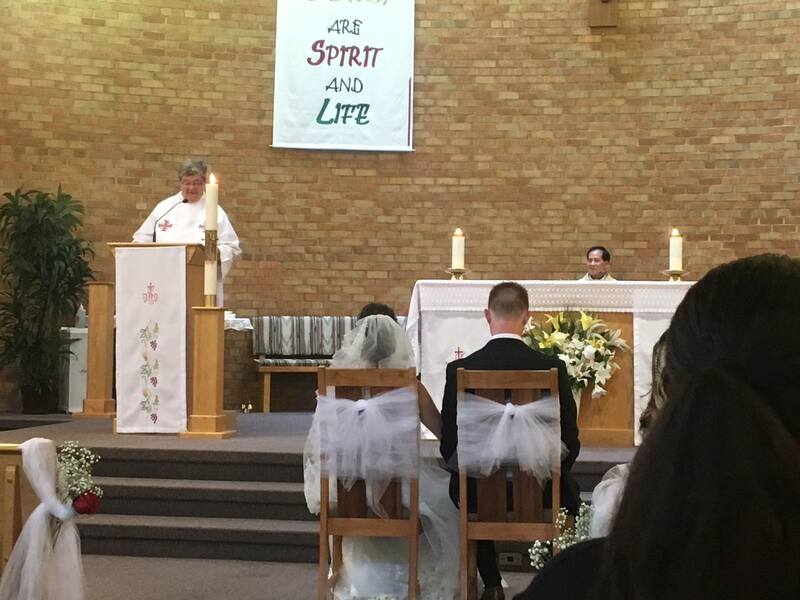 Heartfelt thanks to the local RC bishop who gave permission for me, an Anglican priest, to share this homily in my God-daughter’s Roman Catholic wedding Mass. The story of A.J. and Patsy is used with permission. Those of you who know me, know that I live with a seed grower (Prairie Garden Seeds) whose daughter is following in her father’s footsteps. So the seed language kind’a rubs off on me — I can’t help it. Once in a while, though, that language actually sheds a delightfully new light on church-stuff. Hence the title of this reflection. Recently I preached on Ephesians 4:1-16. Especially verses 1-4 are classic words in ecumenical circles: I therefore, the prisoner in the Lord, beg you to lead a life worthy of the calling to which you have been called, with all humility and gentleness, with patience, bearing with one another in love, making every effort to maintain the unity of the Spirit in the bond of peace. There is one body and one Spirit, just as you were called to the one hope of your calling, one Lord, one faith, one baptism, one God and Father of all, who is above all and through all and in all. It is a massive embarrassment to confess that, over the course of 2,000 years we Christians have utterly failed … utterly failed to live up to this urgent command. Too often we have acted as though the purity of the church could only be achieved/preserved by dividing, by walking away from each other, by denouncing one another, until the only ones left are those who look, talk, think, and act … like us. Differences are no reason for divisions! Spirit-given differences are not a problem but are God’s good gift so that together we can learn how to “speak the truth in love” (verse 15). God’s calling, the unity of the church, in all its diversity, is God’s gift. How have we distorted and denied this gift! We have outright condemned the gifts of others – often and harshly. Paul’s words therefore should be painful, really painful. Divisions in the church betray God’s overflowing grace. Divisions in the Body of Christ reveal our self-centeredness: we prefer to be right in our own eyes. We have no time or interest in others, we don’t want to bother learning how to love those who are genuinely different, whether that involves our atheist neighbour, or the congregation down the street, or our brother/sister in the next pew. Fortunately we can slowly breathe a collective sigh of relief: in the past 100+ years we have been learning to reclaim our God-given unity with fellow Christians. We are working hard to heal the wounds of divisions. We are helping each other to regard differences not as dividing, but as the gifts of God to build up the Body of Christ. Reconciliation and healing, unity in diversity, are the new ways of being church today – whether this pertains to our Indigenous sisters and brothers, to our gay and lesbian fellow-Christians, or to relations among the church traditions. This summer Anglican Bishop Rod Hardwick from the Qu’Appelle Diocese cycled across Canada (yes, Victoria to NFL) in 62 days (completed on July 31) to bring the message of healing and reconciliation to all he encountered. In the past fifty years numerous ecumenical agreements and milestones have been achieved on local, regional and global levels in the church. Shared ministry arrangements are growing, such as my own Anglican/Lutheran partnership in Watrous; inspiring examples of recognizing each other’s gifts and of healing Christ’s Body on earth. Last year’s world-wide events commemorating the 500th anniversary of the Reformation were a shining witness to Catholics and Protestants recognizing Christ in one another, from our own small parish studies, right up to Pope Francis himself. Francis traveled to Lund, Sweden, to join the Lutheran World Federation in prayer. Francis co-presided in prayer with the Archbishop of Canterbury and together they commissioned 18 pairs of Anglican & Catholic bishops for the work of reconciliation and healing between our traditions. Then just as I was enjoying well-deserved time off this summer, a new ecumenical document was released: Walking Together On The Way, written by the Anglican Roman Catholic International Commission (ARCIC). Given the ecumenical animal I am, I didn’t waste time. I read the entire document while relaxing in my backyard (and I’ve passed it on to my RC colleague for his summer reading!). I was utterly surprised and delighted at the message in this text. Compared to other ecumenical texts, this one differs significantly in content, tone and methodology. More than any other, the document truly does justice to Paul’s words to the Ephesians. What is so different, you may ask? Well, instead of stating the usual, “these are the gifts from our tradition that you need in yours,” it reversed the sentence/ question: “what gifts do you have in your tradition that we need in ours?” The entire text is marked by a profound trust and appreciation for the other’s witness to Christ and the Gospel. This appreciation is then coupled with a new, deep humility and honesty about one’s own denominational weaknesses and shortcomings. This is the first official document that applies the principles of what has come to be known as Receptive Ecumenism: Instead of asking what other traditions need to learn from us, we ask what our tradition needs to learn from others, and what we can receive from others which is of God. This approach requires an ‘ecclesial examination of conscience’ with all the challenging implications of those Gospel words – the courage to be self-critical, to make humility a virtue, to risk openness to conversion, reconciliation and healing. Here is truly a refreshing wind blowing in ecumenism-land, opening new pathways towards realizing the unity Christ won for us. While this approach is particularly courageous (and therefore new) for the Roman Catholic Church – which is not known for readily admitting shortcomings or errors – every tradition falls into traps of self-righteousness and arrogance. In fact, faced with difference, each of us can fall into the same trap. It’s not easy to stay out of that trap but it’s mighty important lest we betray our baptismal commitment to follow Christ. What would happen if instead of distancing ourselves from different people, different opinions, different perspectives, we learn to seek that of God in the difference? Ecclesial cross-pollination – do you see it? We are not now what we shall be, but we are on the way. The process is not yet finished, but it is actively going on. This is not the goal but it is the right road. but everything is being cleansed. It is our hope that Walking Together on the Way: Learning to Be the Church—Local, Regional, Universal will be a part of an ongoing process of honest self-reflection and growth. In their 2016 Common Declaration, Pope Francis and Archbishop Justin Welby declared: ‘While, like our predecessors, we ourselves do not yet see solutions to the obstacles before us, we are undeterred. In our trust and joy in the Holy Spirit we are confident that dialogue and engagement with one another will deepen our understanding and help us to discern the mind of Christ for his Church.’ It is important to make clear that by ‘together’ the Commission envisages each communion attending to its own structures and instruments, but aided by the support and example provided by the other communion. The sense is of our two traditions each walking the pilgrim way in each other’s company: ‘pilgrim companions’, making their own journey of conversion into greater life but supported by the other as they do so.